Trim your hips and thighs with a combination of weights and cardio. The keys to losing weight and shedding fat are regular, intense workouts and a calorie-controlled diet. Many women look to target their hips and thighs during training sessions as these are common problem areas for fat storage. Unfortunately, it's impossible to spot reduce fat from specific areas. However, you can reduce your hips and thighs by working on your whole body with a daily weight and exercise plan. While you might not automatically think of weight training as a way to lose weight, it can be a highly effective fat loss method. Half an hour of vigorous weight training can burn up to 266 calories. Weight training also boosts your metabolism, according to MayoClinic.com. Training daily takes a little consideration though — working the same muscle groups two days running doesn't leave enough time for recovery between workouts, so work out your upper body one day and lower body the next. Base your workouts around multi-joint compound moves such as squats, lunges, pushups and dumbbell rows. These hit multiple muscle groups, burn more calories and lead to faster fat loss, according to strength coach Rachel Cosgrove. While you can't spot reduce the weight from your hips and thighs, building the muscles around these areas can give better definition when your body fat levels drop. To tone and define these areas add step-ups, reverse lunges, glute bridge raises and side planks to your routine. Pick four to five exercises each session and perform three sets of eight to 12 reps on each. Cardio plays an important role as it burns calories leading to fat loss, which gives you a reduced hip and thigh area. High intensity and low intensity cardio can both be effective methods for losing weight. Low intensity work burns a higher proportion of calories from fat, but high intensity cardio burns more calories overall, according to the American Council on Exercise. Aim for 20 minutes of cardio each day, alternating days of high and low intensity. On your high intensity days, run, swim, perform sprints or opt for high intensity interval training on a machine at the gym. For low intensity workouts, go for a walk, or perform a light swimming or cycling session. Results don't come from training alone — to get lean hips and thighs you must consider your diet too. Monitor your calorie intake and aim to lose one to two pounds each week. Lower your calorie intake further if your weight loss stagnates. Training every day can be very demanding, so take a rest day if you feel run down and lethargic. 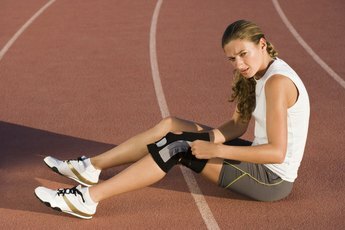 Consult your health care provider before starting an exercise program and ask a qualified instructor for assistance if you're not sure on the technique for any exercises. ACE Fitness: Will I Lose Body Fat More Efficiently by Performing My Aerobic Workouts at a Low, Rather Than a High, Intensity?